Helping a child get into sewing for the first time is one of the best things you can do! You’ll be imbuing a young person with practical skills which allow them to express creativity, solve problems, and let their imagination take them as far as it can! On the other hand, whether or not kids enjoy sewing and stick with it depends largely on the machine they use at first. As any experienced sewist knows, if you learn on a frustrating machine, your experience with sewing will be anything but rewarding. For this guide, we’ve put together a few of our favorite models for youngsters. They’re affordable, accessible, and reliable. We’ll help you figure out which is best suited to the kid in your life, and talk you through everything you need to know to make a good investment in a child’s future with needlework! 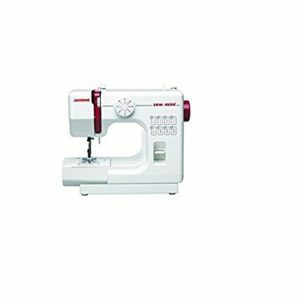 We know–this Janome looks like one of those crappy toy sewing machines you see in the big box store, marketed to kids. It has Hello Kitty-branding, and kids’ colors. Don’t worry, though. It’s a real sewing machine through and through! While most kid-specific sewing machines are cheap and flimsy, the Janome is rock solid. It’s as good as any entry-level sewing machine marketed at adults, and better than most! We think it’s an excellent choice for anyone on a budget. *There are a few variations of this model on the market, and while they might look the same aside from the color, they’re not. We’re recommending the red one. The others are quite good, but the red model is the one with the aluminum frame. It’s built far more sturdily than any other sewing machine we’ve seen marketed directly to kids. The Janome might look like a toy, but it’s hardier than many machines twice the price! It has a metal frame, sturdy plastic casing, and all the metal parts around the sewing end that you’d expect on a model for adults. One way to quickly tell the difference in build quality–look at the weight! It’s 13.2 pounds, which is quite a bit heavier than the Brother below. Between the weight and the powerful motor, which can sew up to 860 stitches per minute, the Hello Kitty can handle any kind of materials your child could want to sew. It’s rugged enough to tackle things like denim and canvas, as long as you use suitable needles. It has 12 built-in stitches to keep a child interested and engaged. They range from basic utility to simple decorative options. There’s also a 4-step buttonhole feature, so they can make functional clothing, bags, and other crafts. Kids will find it easy to choose between their options, using the clearly-marked dials and the stitch chart on the front of the machine. They can also adjust the width and length of their stitches. The Hello Kitty can sew up to a width of 5mm, and a length of 4mm. You can reverse stitches easily, using a simple lever. That makes it super easy for little ones to lock their stitches. While there’s a nice range of features to keep kids interested, the Janome’s simplicity makes it a great learner sewing machine. All the features are clearly marked on the body, and there aren’t so many as to be confusing. Unlike a lot of other entry-level machines, the Janome has manual tension control. That might not seem like the best thing for a child, but it is. With many automatic-tension machines, there’s no manual override. So, if a child manages to get something thrown off, it’s hard to fix without a trip to the dealer. With the Janome Hello Kitty, you can always reset the machine and get it working properly for the child. You can also teach them about tensioning, so that they can problem-solve themselves! It’s an important skill that’s easy to teach on this model. Plus, given the build quality, it’s pretty hard to mess anything up permanently. When you compare the Hello Kitty to other inexpensive options like the popular Brother XR models, tension is a big advantage. Those other cheap machines create birds’ nests and looping more often than not. This one is neat and consistent. That’s our key reason for recommending this: it’s a rugged test ground that provides a kid room to explore without running the risk of damaging the machine. It has snap-on presser feet, so kids don’t need tools or adult help to switch between them. We also like that the presser feet lift to an extra high position, which keeps little fingers safe. The 3-piece feed dog system is simple, but effective. The Janome has a free arm, so kids can learn how to sew cylindrically. It’s full-size, but compact and light enough for kids of 8+ years to bring to sewing class. There’s even a folding handle built into the frame to help them carry it! It has a nice, bright worklight. The manual is super clear and helpful. Even young ones can easily read it and get to know their new machine. This is an all-manual machine, and it’s relatively basic. 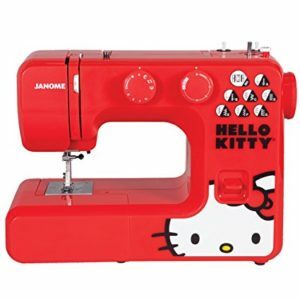 The Janome Hello Kitty has less than half the built-in stitches you’d get on the Brother below. If your child wants lots of shortcuts or extra features, they might not love this one. Unlike a lot of other entry-level sewing machines being made today, the Hello Kitty has a front-loading bobbin. It’s a bit trickier to master than drop-in bobbin compartments. However, most of us have learned to sew with front-loading bobbins, so it’s not a huge downside. The other tricky bit to master is threading the needle. It’s no harder than on your traditional sewing machine, but the Hello Kitty doesn’t have one of the automatic needle-threaders that are so common these days. All the key parts are built very well, but the casing and knobs are still plastic. The Brother XM2701 is our pick for folks who want the most bang for their buck. It’s sized about the same as the Janome Hello Kitty, but trades some sturdiness for convenience and features. The Brother is perfect for kids who want to take a few shortcuts in order to get right into creating. It will thread needles for them, simplify most tasks, and make the world of bobbins less difficult. It’s our recommendation to anyone on a budget who wants something feature-packed and accessible to give a youngster! The Brother has more stitches built in than the Janome. There are 27, spanning a range of decorative, blind hem, zigzag and stretch stitches. That’s a lot of variety for kids to pick from. If your child is the sort to get bored easily, this is a great choice. Like the Janome, the Brother’s stitches are all selectable via a dial on the front of the machine. They’re all diagrammed out directly above the dial. It’s all very intuitive to navigate. Stitch width and length are adjustable as well, and each has a dedicated dial on the top of the machine. There’s a reversing lever for locking off stitches. It’s located in the same place as the Janome’s, and is equally straightforward to use. The Brother also has quick-connect feet. Kids often struggle the most with the setup part of sewing. Not being able to get quickly to the fun part–creating–can be frustrating for them. If you know you’re shopping for a child who will get overwhelmed by trying to learn fiddly bits like threading the needle, the Brother should be ideal. 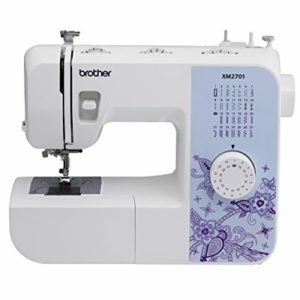 It has a built-in needle-threader feature which make it super easy to get right to sewing. With the Janome’s we’ve recommended as our other kids’ picks, you’ll have to teach young sewists how to thread needles manually. That can be tricky to master. So, if you’re not experienced enough to teach young ones tricks, or if you know your child doesn’t do well with frustrating little tasks like this, the Brother’s an excellent alternative. Less patient kids will especially appreciate the drop-in bobbin compartment on the Brother! Instead of fiddling around with a side drawer until things line up, as you do on the Janome, you can just drop in your bobbin and get to work. It’s very reliable, and jam-resistant as well. A great feature for young ones who haven’t got fine motor skills quite under control yet. Another benefit of the drop-in bobbin compartment is having a clear window that shows you how much thread you’ve got left! The buttonhole feature on the Brother is also simplified compared to the one on the Janome. It only has one step instead of four, and it resizes automatically to the buttons you use. That makes it quite a bit easier for young ones to use than the Janome’s. The LED worklight lasts longer than the incandescent bulb on the Janome Hello Kitty. While it doesn’t have the Hello Kitty’s kid-specific decorations, the Brother has a fun print on the front which will be appealing to young ones. It’s very light. At just under 10 pounds, the Brother is easy for younger ones to move around and handle. It comes with a helpful instruction DVD as well as a manual. You can watch the videos on Youtube as well, if you find that easier. Overall, we’re very impressed by Brother’s materials. They’re good enough for an adult who’s not that experienced to learn and then teach to a child. Because it automatically adjusts tension, it eliminates a whole step of instruction for kids! It’s covered by a much longer warranty than the Janome: 25 years! It’s slightly more affordable than the Janome, at less than $100! The Brother is built much more lightly than the Hello Kitty. It has far fewer metal parts, and simply feels cheaper. Even some of the feet are made from plastic. It’s not going to hold up as well to the learning curve. If you aren’t sure you’re buying for a careful child who will treat the machine gently, you should avoid the Brother. Being rather light, it’s less forgiving of user errors than the Hello Kitty. That’s why we give the Brother lower marks for consistency. It also moves around fairly easily if you work with layers or heavier materials. It’s a good idea to use this one on a mat. While you get a longer warranty, you’re more likely to have to use it. This model is better than the XR model it replaced, but it still doesn’t compare favorably to Janome’s. You could also get frustrated if you don’t know up front what the warranty terms entail. Repairs mean a trip to an authorized Brother service center. If there’s not one near you, you’ll be responsible for shipping the machine back to the company–on your dime. We mention all this not just because the Brother is built lightly–it also has automatic tensioning. That’s convenient in most cases, but it means you can’t always trouble-shoot and correct the settings manually. You’d have to have it reset at a service center. Depending on where you live, that could be quite inconvenient. Brother also have poor quality control these days. A percentage of these turn out to be lemons, even though the rest are quite good. So, even if you’re buying this for a gift at a holiday, you or another adult who’s skilled at needlework should give it a thorough test run and inspection before your return window is up. The pedal is rather jerky. That’s common on machines under $200, but worth taking into account given that a child will be using this. Even though LED bulbs last longer than incandescents, this particular one is a bit dim. The Janome Magnolia is our ultimate choice for kids. It’s too expensive to recommend for most children’s first machine, but it’s the perfect workstation for ambitious older kids of 10-18. The Magnolia combines the build quality on the Hello Kitty with the versatility and convenience of the Brother–and then some! It has a full computer onboard, which provides it with lots of automatic and built-in features. If you have a young person in your life who’s outgrown their basic manual machine, this one offers some more convenience and variety to keep them going! It has 30 stitches onboard right out of the box. That’s more than the Brother, and more than twice as many options as the Hello Kitty has. The Magnolia gives kids lots of room to explore and play. You can see them all with the diagrams on the front of the machine, just like our other picks. The simple up and down navigation system is easy for kids to work with without getting lost in menus. They’ll use the same buttons and format to choose stitches and make modifications to length and width. 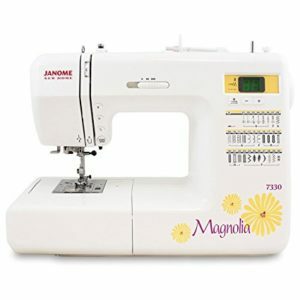 Between the simplified navigation and the excellent instruction book, the Janome Magnolia is much easier for kids to master than many more recent computerized models. It also has a built-in needle threader, like the Brother. It works just as well, and is noticeably better-made. Given that kids will probably use it every time they start sewing, that’s important! Unlike our cheaper picks, you can drop the feed dogs to work on free-motion projects. That’s something which will keep more advanced kids improving and expanding their abilities. The Magnolia’s feed dogs are also a 7-piece system, which has more finesse than the Brother or the Hello Kitty. They’re especially good on layered projects and seams. This one has an auto-declutch bobbin winder, as well as a top-loading bobbin. Those are two major upgrades on the convenience front over the Hello Kitty. It’s easier to get started with each project, and young ones can see how much thread they have left. While there are newer models on the market (and we’ve included them below), none of them can quite stack up to the Magnolia in terms of build quality. This thing is one of the heaviest computerized models ever! That’s thanks to a cast iron frame, and all-metal innards. Having such a sturdy machine is a good way to ensure that a kid’s sewing machine lasts for years. Even older children can be rougher on their equipment than an experienced adult sewist. Plus, the extra weight and rigidity lends the Magnolia a consistency, especially with tougher materials. As long as you pick appropriate speeds and use suitable needles, there isn’t much the Magnolia won’t sew. Corduroy, denim, moleskin, and typical leathers are all perfectly doable on the Magnolia. It’s an excellent option for preteens and teens who want to make some of their own clothing pieces! You can control the speed via a slider on the body. That works along with a stop/start button to give you another way to sew! You can use this one without the pedal, and find those in-between speeds that are sometimes hard to get right using your foot. The Magnolia’s precise speed control slider offers a degree of precision that’s hard to achieve on either the Hello Kitty or Brother models above. You can still use the Magnolia with the pedal, too. If you use the pedal, the slider will set your top speed limit. That’s a great feature for kids to stay within the limits of their abilities. The Magnolia also has a memorized set of needle stop positions. Kids can find their preferred settings and make the machine a little more personalized! It has 6 different one-step buttonhole designs onboard. All of them adjust automatically to the size of the buttons being used, just like on the Brother. It has a locking stitch button as well. That’s a neater and easier way to lock off a stitch than to use the reversing function. It’s better for delicate fabrics and decorative stitches. The tension functions a lot like an automatic, but with a manual adjustment knob for you to make your own tweaks. The sturdiness of the machine really helps it stay aligned. It’s covered by a 25-year warranty. The Magnolia also has an excellent reputation for reliability. It’s quiet. Most kids won’t care much about noise level, but if you’ve got an older child or teen who stays up late with craft projects, this one might do wonders for your ability to sleep! It’s quite expensive for a kid’s machine. We don’t recommend this as a child’s first machine, since it’s definitely overkill. However, if your youngster is definitely going to be sticking with sewing, it’s a great reward for their dedication and progress. It doesn’t come with that many accessories. You get the basic feet and notions, but nothing else. The Magnolia is super convenient to use because of its computerized features. However, compared to more recent computerized models, it doesn’t have very many features. 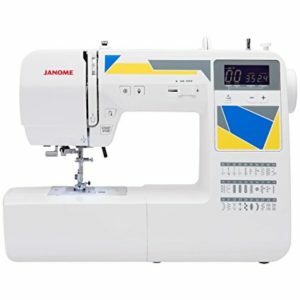 If you want a computerized model with more stitch options, check out the Janome MOD series in our “See Also” spot below! Having such sturdy build quality makes this one firmly child-proof. On the downside, it makes for quite a heavy machine. Younger kids won’t be able to lift this easily. That’s another reason we recommend it mainly to older kids. It doesn’t have an automatic thread cutter. The Janome Hello Kitty isn’t actually any less expensive than the Brother, but we’re still recommending it as our budget pick. Why? The Brother gives you a lot more features for your money, sure. The Janome is a much better long term investment. It has fewer features, but they all work extremely well and are built solidly. We think that as long as your child is patient enough to learn on an all-manual machine, it’s the better choice for the long haul. They’ll develop valuable technique and precision that they’d miss by starting on a machine with as many shortcuts as the Brother. Just be sure that you either have the skill and time to teach them, or enroll them in a class! The Brother is certainly a good machine in its own right, and it will appeal to folks who want maximum bang for their buck. It has lots of features, and it’s probably the easiest of the three for most kids to learn on. There’s a reason this is the most popular machine on the market right now. We think the Brother is a good choice for kids who don’t do well with tricky little tasks that require lots of patience and precision. It leapfrogs over the process of learning to thread, adjust tension, and so forth. If you know you’re shopping for a child who will get frustrated unless they can get right to the fun part, go for the Brother! However, the Brother’s lightweight build and mostly plastic components make it a bit riskier over the long term than the Janome. It’s more likely to have issues with tensioning and consistency. The fact that there aren’t as many manual adjustments also makes it more of a pain to fix. If you want the absolute best quality machine for an ambitious child, the Janome Magnolia is our top pick. It’s a machine which, while expensive, provides lots of room for young needleworkers to grow and learn. It’s built so well that it could very well be your child’s machine when they’re an adult! The only complaint we have about the Magnolia is that while it holds its own against most more recent computerized models, its built-in stitches are near the bottom of the pack these days. Still, unless you’re shopping for an advanced teen needleworker, we don’t think it’ll be an issue at all. If you think your child will love having a computerized machine like the Magnolia, and aren’t as worried about indestructible build quality, you should have a look at Janome’s MOD series. These are technically updates to the Magnolia family, but the 7330 is still such a popular model that the MOD’s haven’t actually replaced it just yet! The big difference is the frame. The MOD’s have aluminum frames which are significantly lighter than the cast-iron frame in the Magnolia 7330. That makes for a much more portable machine. The MOD series models, especially the MOD 30 that we’re focusing on here, also cut the cost of a computerized sewing machine in half! They might have fewer metal parts than the Magnolia, but they’re much better-made than other inexpensive computerized options from Brother or Singer. Check out the MOD series if you think your child would like some extra options, without your having to spend too much money! We’ve recommended all full-sized sewing machines for kids. That’s very much by design. We generally think that any child who can manage a full-size sewing machine should learn on one. That gives them more room to create, more power in the motor, and less of a learning curve when they graduate to their next machine. The Mini 2 is quite small, but it’s still made in the same Janome factories as the larger machines from the company. It’s super simple, with one dial and only a few switches. Although its slower speeds do mean kids will eventually grow out of it, the Mini 2 is a good choice for younger hands who can get overwhelmed by faster machines. It’s sturdy, simple to use, and is an excellent first sewing machine for little ones. Having said all that, we actually think the Hello Kitty is a hardier choice, despite what you might think from the decorations. The Mini 2 doesn’t have as many metal components, and it’s quite lightweight. You wouldn’t want to work with heavier materials on this one, or expect it to stand up to as much use as a full-sized model with more metal parts. We don’t think it’s the best choice for any kids who can manage a larger machine. The first thing anyone shopping for a kids’ sewing machine needs to do is figure out what kind of budget they have to work with. Thankfully, there’s a lot to choose from, even within the $100-$500 range that we suggest for most buyers. You can find something simple and sturdy, or something lighter, but packed with features to keep kids interested. Even if you’re getting a miniature machine, you shouldn’t spend less than $75. Under that mark, you’re looking at toy machines which won’t work properly. They’ll break quickly, and have awkward features and quality control issues that frustrate kids. We recommend that those shopping for a younger child or for a kid’s first machine spend ~$100-$200. If you’re looking for something to suit an older kid who’s going to want more features and functions, you should plan to spend a bit more. The maximum we think anyone should be spending on a kid’s sewing machine is $500. In most cases, that’s more than enough–even for driven teens. You’re the best judge of how committed the kid in your life is to sewing. If you know they’ll be sticking with it and continuing to create for years to come, there’s no reason not to support them with a machine closer to the $500 mark. However, if you’re not sure whether needlework is a phase for them, you might want to be more conservative. Choosing between manual and computerized sewing machines is the biggest decision you have to make these days. It’s even trickier when you’re shopping for someone else! As you consider your options, put some thought into whether your child will do best with a manual or computerized sewing machine. In most cases, even though computerized machines are wonderfully convenient, we don’t think they should be anyone’s first machine. They offer lots of great shortcuts, but like most shortcuts, they do skip over some key learning opportunities for kids. We think that any kid who learns on a manual machine before going to a computerized model will have better intuition, problem-solving faculties, and finesse than anyone who starts out on computerized models. However, if you know that the kid you’re shopping for has already mastered the basics, there’s no reason not to give them the versatility and convenience of a computerized model. Similarly, if you know you’re buying for a kid who is easily frustrated by the kind of menial, tricky tasks that you have to master to use a manual machine, you may as well avoid them. It’s better to get a kid sewing without knowing how to thread a needle or adjust tension than to make them so frustrated that they give up completely! You should know that computerized models (especially the good ones) will cost you a good bit more money than manual models. If you’re trying to find something affordable with an onboard computer, check out our See Also section above. As you’re choosing between models, be sure to consider the age and abilities of the child you’re shopping for. If they’re quite young, they probably don’t need lots of features. Likewise, if they’re older, they could be bored by something with too few options. Think about whether your child has any experience with sewing machines, sewing by hand, or other crafting techniques. Are they good at precise fingerwork, or do they need a bit of assistance from automatic features to make their creations a reality? The better a machine suits your child’s age and skillset, the more they’ll love it! Finally, in order to choose between machines, you should have a good idea in mind of the kind of sewing your child wants to do. Are they interested in garments? Quilts? Craft projects? Figuring out what kids actually want to do before you buy a machine is the best way to make sure you end up giving them a machine that they enjoy. If you think one of the recommendations in this guide is a good fit for your kid, clicking on the links in its review is the best way to find more information. Or, if you’re still searching for the best machine for your child, you might try having a look at our overall favorite sewing machines on our homepage! You could also have a look at our guide to the best mini sewing machines, to find something ideal for smaller hands!